Ok... here I am again not being able to post lately due to a ton of stuff I need to do... So I'll just post some random thoughts here for now. 1. Don't place your laptop on the floor at night and wake up in the middle of the night walking around in the dark. There is a possibility that you'll step on it. 2. 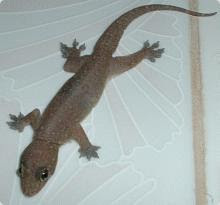 One night when I got home, I saw a huge lizard playing inside my favorite drinking glass. Even though how many times I've sterilized it, I opted to retire the glass cause I can't stand using it and thinking of that lizard inside while I'm drinking. Blechhh!!! 3. If you happen to find a PLDT phone card on top of a PLDT phone booth, chances are it's because it has no more credits. (Ok, I had to try it out, it was just there and I was down to my last P2.00). 4. When you use a pay phone and can successfully dial but the other party can't hear you and you dial again, they'll think it's a prank call. It's frustrating cause it's a legitimate call but since the other person doesn't hear anything, you've already agitated and angered them even before you get to speak with them. 5. I have two cousins who are sisters and currently confined in the same hospital at neighboring rooms (just across each other). My tita (their mom) has to go back and forth both rooms. Why can't the hospital just place them together in one room ? They do have the same sickness, and their mom is getting tired switching from one room to the other. Is it cause the hospital gets to bill them double ? 6. Even though the last time I've been hospitalized was around 17 years ago when I had dengue, all the memories come back instantly, when you visit someone in the same condition you were at that time. And for one who has a low tolerance for pain, I can't stand seeing the needles stuck in ones body. 7. I think I made a personal record of calling 20 people I don't know on the phone in just 5 minutes. Okey it's was cause I was inquiring for a certain product that no store had. 9. I am slowly becoming a hot tea addict. I just bought a pack of orange tea and red tea even though I haven't finished my jasmine tea box yet. I want to try them all. 10. I have tried to concentrate on working on my laptop in a bench with a couple right beside me smooching it away. It is very distracting. And I refuse to move elsewhere cause I was there first. I wish I had a webcam with me then and would broadcast them live on the net while I work.